Miyamoto If I remember correctly, the first animation Kotabe-san drew for us was of Luigi spinning around in circles. But we couldn’t use that many frames, so we couldn’t use it in a game. Kotabe Yeah. At that time I was drawing a lot of stuff that no one could use. Miyamoto But then an opportunity arose for something I thought we should definitely ask Kotabe-san to work on. We did it together with Fuji Television. Iwata Yume Kojo: Doki Doki Panic? (A game developed for the Family Computer Disk System in cooperation between Nintendo and Fuji Television and released in 1987. It later became the basis for the game known to the American audience as Super Mario Bros. 2, originally released in 1988). Kotabe Ah, I remember it. Miyamoto I wanted the rug movement to be smooth. Kotabe So I drew him a rug that moved smoothly, and he told me it had too many frames! Miyamoto The original animation had over ten frames, but we needed to cut some out and repeat the same ones over and over so the frame count would be low but the rug’s movement would be smooth. Kotabe I think it was three. And we used them in reverse, too. Miyamoto That was the first video game work I ever requested from Kotabe-san. Iwata You also asked him to do a lot of illustrations for Mario. 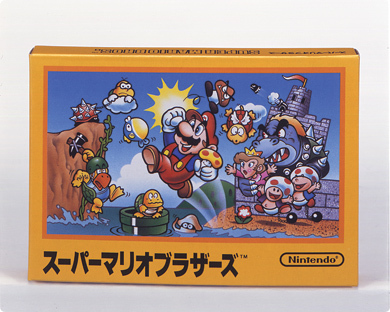 Kotabe Mario was pixel art, so the only reference was the package illustration for Super Mario Bros.
Miyamoto That’s right. Kotabe-san turned that into the Mario we see today. Originally, ever since we made Donkey Kong, (Nintendo arcade game that appeared in 1981. Released for the NES originally in 1993), on many occasions I had done rough sketches of Mario in pencil and then given them to an external illustrator to polish up. When we came out with Super Mario Bros., I was thinking about asking a professional manga artist or a well-known illustrator to do the art, but time was running out, so I drew the original art for the package myself. Kotabe So when I went to draw Mario, that one package illustration was all I had to go by. Then I heard Miyamoto-san was the artist, so I asked him all sorts of questions. Is this face ok? Is he like this? Miyamoto That’s right. He asked me a lot of questions. What’s incredible is that both Kozai-san and Kotabe-san are so amazingly talented. Miyamoto Peach completely changed. I told him everything I wanted, like how I wanted the eyes to be a little cat-like. Kotabe And how she should look stubborn. Kotabe Oh, I remember you talking about that. Miyamoto I told him how I liked that ox. Miyamoto He said it was a turtle. Iwata You learned from Kotabe-san’s drawings, introduced them into the game, and it would suddenly look a lot better. Later on, games started becoming 3-D, and Kotabe-san’s skills became even more important for us. Kotabe When we were making Super Mario 64, (3-D platform game released for the Nintendo 64 originally in 1996), the development staff was always holding meetings. Iwata Since we’re talking about Mario 64, let’s have Koizumi-san join the conversation. I had intended to have him join in when we got to Flipnote Studio, though. Iwata Koizumi-san, how did you first meet Kotabe-san? Koizumi The first person I worked together with after entering the company was Kotabe-san. Koizumi The two of them conducted my interview. Koizumi So I started expounding animation theory and even video game theory. Iwata It’s quite a student who would dare to explicate animation theory in front of Kotabe-san and video game theory in front of Miyamoto-san! Kotabe Miyamoto-san told me you were supposed to keep working as a character illustrator for a while. Miyamoto I told him to develop Koizumi-san’s skills. Koizumi Really? I didn’t know that. Kotabe What I remember well from that time is Mario Kart, (Super Mario Kart: Released in 1992 for the Super NES). At Toei Animation, they always said, “Look at the real thing,” so I forced through a budget to do just that. Koizumi We set out for some field research. I drove a go-kart for the first time and closely observed their structure. Kotabe Looking at photos or searching for material on the Internet isn’t enough. You’ve got to see the real thing and take it all inside yourself. That field trip really paid off when we made Mario Kart. Koizumi Yes. Thanks to you. Kotabe But then the game development staff fell shorthanded, and Koizumi-san got taken away from me. Kotabe That’s why I’ve been trapped at Nintendo for 21 years!